When CruiseWeek first visited Great Stirrup Cay in 1998, it was a very small place, barely able to handle NCL's Leeward with its 1,000 or so guests. Revisiting recently, he finds NCL's private Bahamian island – the industry’s first, dating from 1977 -- has undergone huge expansion and is now up to par with the newest private islands. 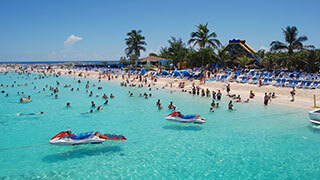 The only modern-day private island facility that Great Stirrup Cay doesn't have is a pier. That's a challenge, but the good news is that NCL operates four large tenders that carry hundreds of people at one time. These walk on, walk off tenders make it easy for people to get ashore, and they operate continuously throughout the day. The biggest change is that NCL has gone from a very limited area for vacationers to essentially going all the way around the 250-acre island with either beaches, activities, bars, or restaurants. On the far side of the island, they dredged a huge area of sand and moved it to the good side of the island. Last year, Hurricane Matthew delayed the reopening of Stirrup Cay. But even with another big storm, there’s now plenty of sand to promptly replenish the beach. There’s plenty of space and amenities for everyone CruiseWeek’s visit aboard Norwegian Sky brought 2,000 people to the island, but there are 3,000 new chairs. That's essential for relaxation. Water sports include an eco-boat tour, and snorkelers report that the new underwater sculptures are terrific. Land activities, such as a zip-line and basketball and volleyball courts, are there for those who don't want to just lay around. When it comes to food and drink, there are new bars, and the redone 8,500 square-foot buffet area is easy to navigate. There are four food lines with a goal of no guest waiting more than ten minutes to go through even at peak times. And there's a set-apart Abaco Taco. Pathways, seating, and shaded lounge areas help round out the improvements. The new cabanas for either six or eight guests cost US$299 and US$319, respectively. The larger ones are nicer and more private because they're built higher up. But both sizes offer good beach views and it's a good treat for a few couples or a family group. The next development will be a private lagoon enclave area for suite guests and those staying in the line's onboard Haven areas. This spot will include 22 new lagoon villas and 16 oceanfront studios.